Caroline Bascomb Compson, the mother of the family, a dithering, self-obsessed hypochondriac who is unable to connect with or support her children. She favors Jason for some reason, and is preoccupied with the honor of her Bascomb family name. She is immensely prideful. Dilsey’s teenaged grandson, who likes to make mischief but is able to fully care for Benjy. Dilsey’s husband, the patriarch of the Gibsons, Roskus suffers from paralyzing rheumatism and talks about how unlucky the Compsons are. The Compson children’s grandmother, who never appears in the novel except when she dies. A symbol of the old South and its death. Dilsey’s son, who accidentally gets drunk with Benjy at Caddy’s wedding. Dilsey’s daughter, another Compson servant. Dilsey’s son, who is Benjy’s caretaker for a while. Caroline’s brother, a man who lives by borrowing money and food from the family, and has an affair with their neighbor, Mrs. Patterson. A man from a traveling minstrel show who runs away with Miss Quentin. Jason’s boss at the farm supply store, an honorable man who is patient with Jason’s sarcasm. Caddy’s first lover, and possibly the father of her child. Caddy’s husband, who was once known for cheating at cards. He divorces Caddy when he learns that Miss Quentin is not his child. A handsome, swaggering Harvard student who boasts of his exploits with women. Gerald’s mother, who accompanies him and brags about him. A Harvard boy who makes fun of Quentin’s virginity. A black man who hangs around Harvard and befriends Quentin. A visiting preacher who delivers a powerful Easter sermon. A prostitute that Jason visits in Memphis. The Compsons’ neighbor, who has an affair with Uncle Maury. Mrs. Patterson’s husband, who learns of his wife’s affair when he intercepts Benjy delivering her a love letter from Maury. The first boy Caddy kisses. A man who beats Benjy after Benjy chases some schoolgirls. He is the father of one of the girls. A girl Quentin kissed, who makes Caddy jealous. The angry brother of an Italian girl who follows Quentin. A town librarian who sees a picture of Caddy in a magazine, long after Caddy has left town. She wants to save Caddy, but realizes it would be impossible. Cosby, Matt. 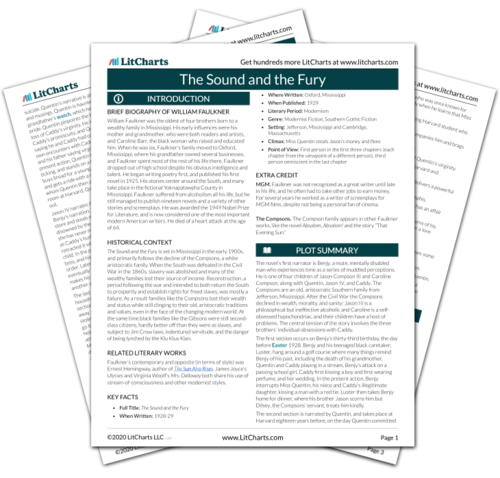 "The Sound and the Fury Characters." LitCharts. LitCharts LLC, 19 Mar 2014. Web. 22 Apr 2019. Cosby, Matt. "The Sound and the Fury Characters." LitCharts LLC, March 19, 2014. 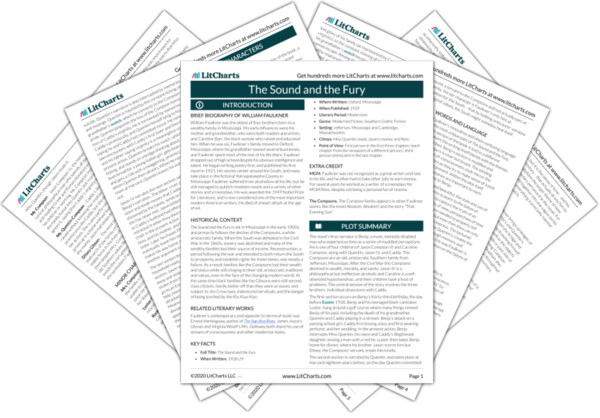 Retrieved April 22, 2019. https://www.litcharts.com/lit/the-sound-and-the-fury/characters.